George Washington Brown, editor of the "Herald of Freedom" newspaper, was one of seven free state leaders arrested on May 14, 1856, on charges of high treason and held prisoner by federal troops near Lecompton, Kansas Territory. 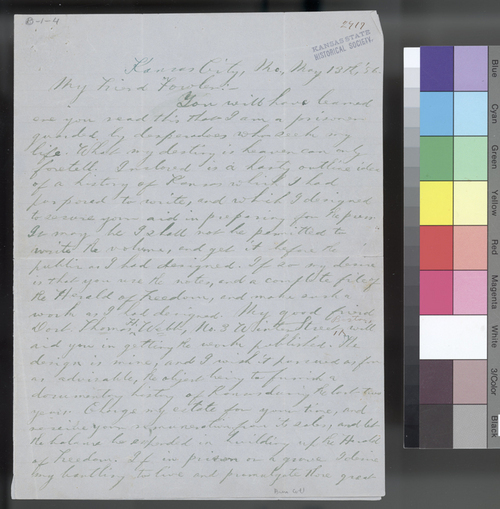 In this letter, written from Kansas City, Missouri, to his friend, Fowler, on the day before his arrest, Brown expresses concern that his life could be in danger. He encloses an outline for a "Documentary History of Kansas," and asks Fowler to publish a book based upon the outline.